CNG: eAuction 109. CLAUDIUS. 41-54 AD. AR Denarius (18mm, 3.50 gm, 3h). Rome mint. 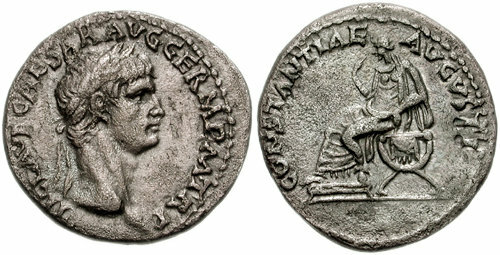 Struck circa 41-42 AD. 109, Lot: 201. Estimate $750. CLAUDIUS. 41-54 AD. AR Denarius (18mm, 3.50 gm, 3h). Rome mint. Struck circa 41-42 AD. Laureate head right / Constantia seated left on curule chair, feet on footstool. RIC I 14; von Kaenel 181 (V116/R117); BMCRE 13; RSC 6. VF, toned, some roughness. This coin is from one of the first issues of coinage under Claudius. This coin's reverse, with its unusual personification (that of Constantia), is a special reference to Claudius, representing 'courage' or 'resolution' in civil life -- exactly what enabled Claudius to survive for so long in the fatally disfunctional family of the Julio-Claudians. Constantia's hand held to her mouth suggests deliberate self-restraint, an affirmation that Claudius would be quite different than his irrational predecessor and nephew, Caligula. Thus, the message of this type was well-conceived for an early issue, emphasizing his urgent need to publicly distance himself from Caligula's rule-by-terror and proclaiming a new regime of steadfast, mature rule.